Orthodontia (otherwise known as orthodontics) is a specialty in the field of dentistry. Orthodontia is focused specifically on the treatment of teeth irregularities (particularly alignment and occlusion), as well as the jaws. It commonly involves the application of braces as a treatment method. An orthodontist, then, is a specialist in the field of orthodontics. Orthodontists and dentists work together to care for your oral health. However, when it comes to some of the oral health issues outlined above, seeing an orthodontist is essential, so that you can get treatment specific to your needs. Just as you would go to a heart surgeon for heart surgery rather than your family doctor, you’ll go to an orthodontist if you need treatment for teeth and jaw alignment issues, rather than your dentist. 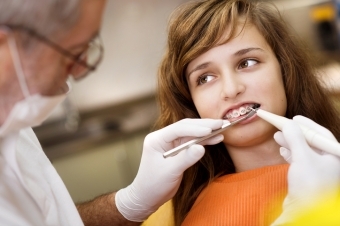 To become an orthodontic specialist in Canada, you must first become a dentist! All told, becoming a certified specialist in orthodontics usually takes about 12 years of formal university education. It’s a long haul! An orthodontist’s university career starts off with a four-year bachelor’s degree, most often a Bachelor of Science degree. Next comes dental school, which takes another 4 years to complete. After 8 years of university, the student graduates and officially becomes a general dentist! For many, a career as a general dentist starts at this point. However, others may choose to pursue a dental specialty, such as orthodontics, and this means more school. To specialize in orthodontics, the dental student must continue with an additional 3-year Master of Science Degree and residency program. Many schools also require students to complete an additional 1-2 years of formal training as a general dentist before to entering a specialty residency, such as a hospital residency. Once the aspiring orthodontist has graduated from the orthodontic specialty residency program, he must pass the national dental specialty board certification exam, which is governed by the Royal College of Dentists of Canada. If he passes, our student is officially a certified specialist on orthodontics. If you have more questions about what an orthodontist is and how we can help you improve your smile, contact Vancouver Orthodontics today.